Admission fee Rs. 500/- Only. 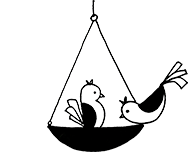 Visit: 12:00 PM to 07:00 PM on Monday to Friday and 08:00 AM to 01:00 PM on Saturday. 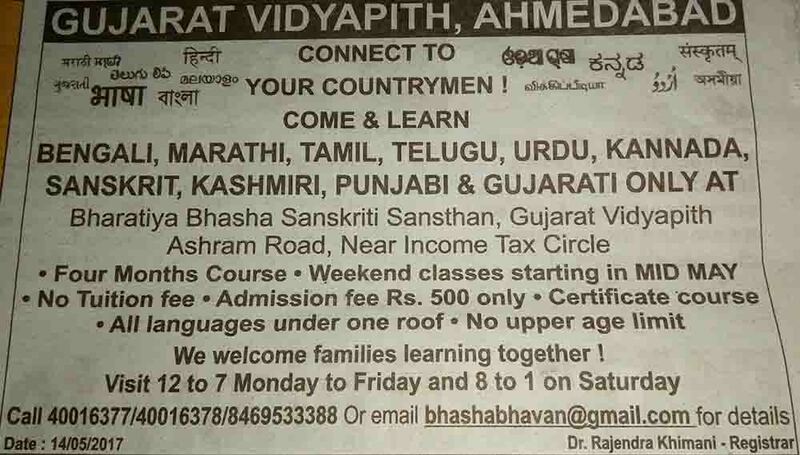 Gujarat Vidyapith organising Short term weekend courses in Indian Languages as Bengali, Marathi, Tamil, Telugu, Sanskrit, Urdu, Kannada, Malayalam etc. Summer Coding Program Let’s Code to Express and Problem Solve An engaging way to introduce kids to computational concepts and inspire them to learn computer science. 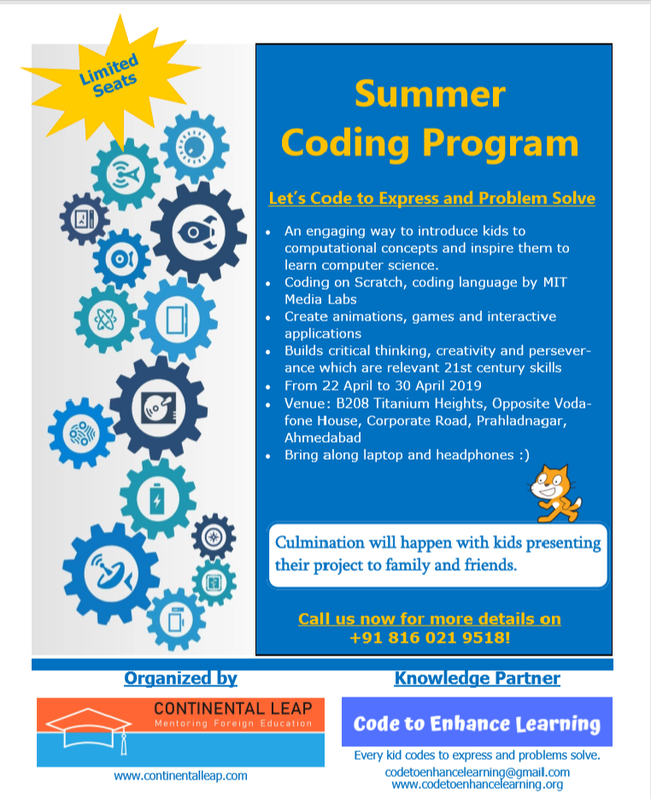 • Coding on Scratch, coding language by MIT Media Labs • Create animations, games and interactive applications • Builds critical thinking, creativity and perseverance which are relevant 21st century skills At Continental Leap it is our constant endeavor to give exposure of various fields of study and eventually careers to kids. As a part of this, we are organizing a workshop for kids to learn CODING. 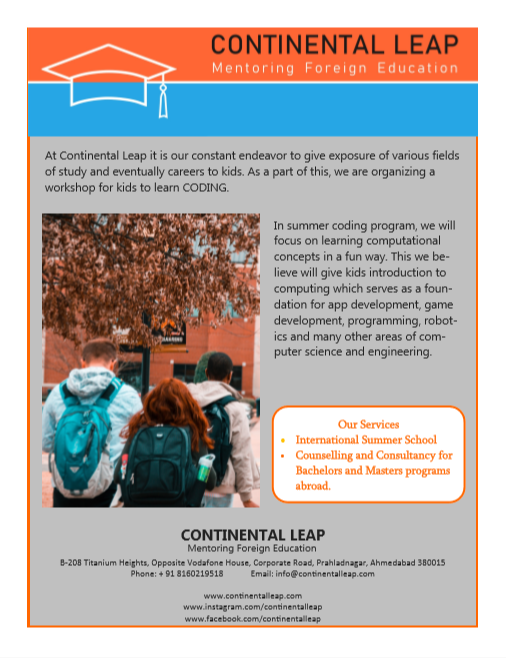 In summer coding program, we will focus on learning computational concepts in a fun way. This we believe will give kids introduction to computing which serves as a foundation for app development, game development, programming, robotics and many other areas of computer science and engineering Bring along laptop and headphones. Culmination will happen with kids presenting their project to family and friends. An engaging way to introduce kids to computational concepts and inspire them to learn computer science. At Continental Leap it is our constant endeavor to give exposure of various fields of study and eventually careers to kids. As a part of this, we are organizing a workshop for kids to learn CODING. Bring along laptop and headphones. Culmination will happen with kids presenting their project to family and friends. In Indian philosophy and Hindu mythology, Bindu (a point or dot) is the source of energy and life, it’s where the creation is born. Bindu is, “shunya”- the abstract of nothingness and yet that which has the ability to add value to whatever it is affixed to. 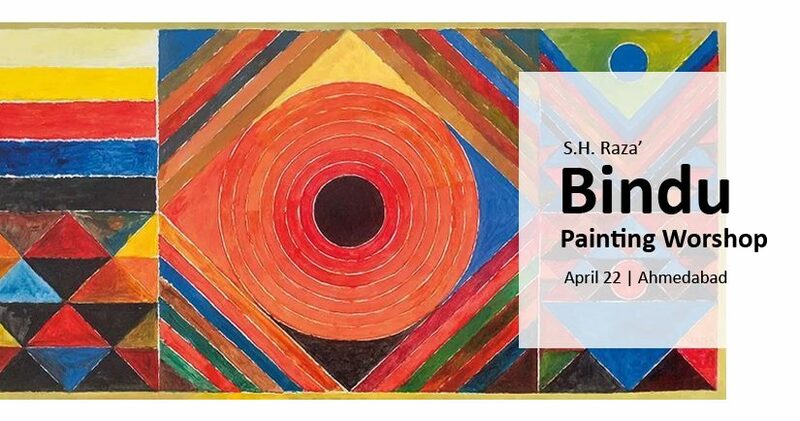 Come and learn the art of acrylic painting inspired from the series of, “Bindu” by India’s famous contemporary abstract artist – “S.H.Raza” in this workshop. Acrylic painting is a type of painting where you apply with the paint brush single or multiple layers of acrylic paint which is water soluble and dries fast. Acrylic painting can be done with either finesse or smoothly or with the brush strokes seen or impasto way. This workshop is organized by pH Designs in collaboration with Versatile Maniacs. 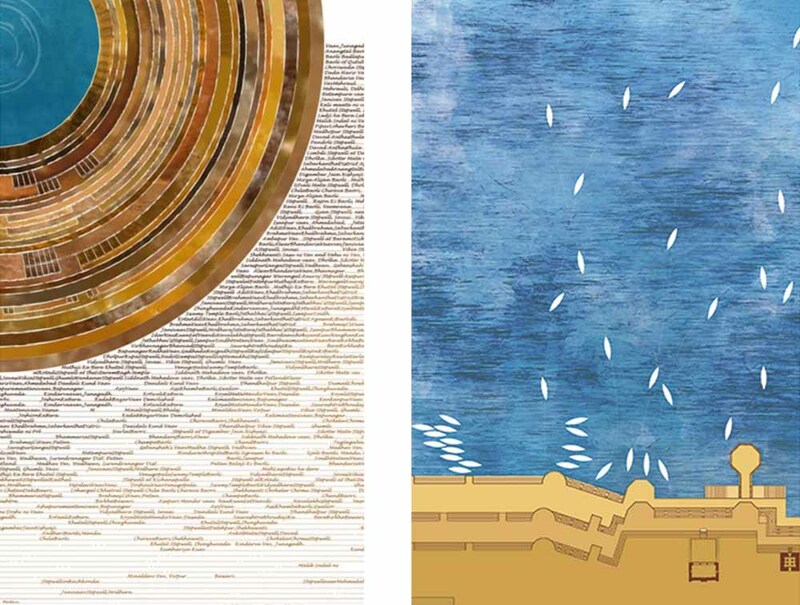 Workshop details : – Introduction to Round, Flat and Filbert brushes. – Techniques of painting. – Color mixing and merging on pallet and canvass. – Practice sheets to practice the techniques of painting with acrylic color. – Doing final artwork on canvass (take away) – Canvass Size : 10*12 inches Source : Facebook. 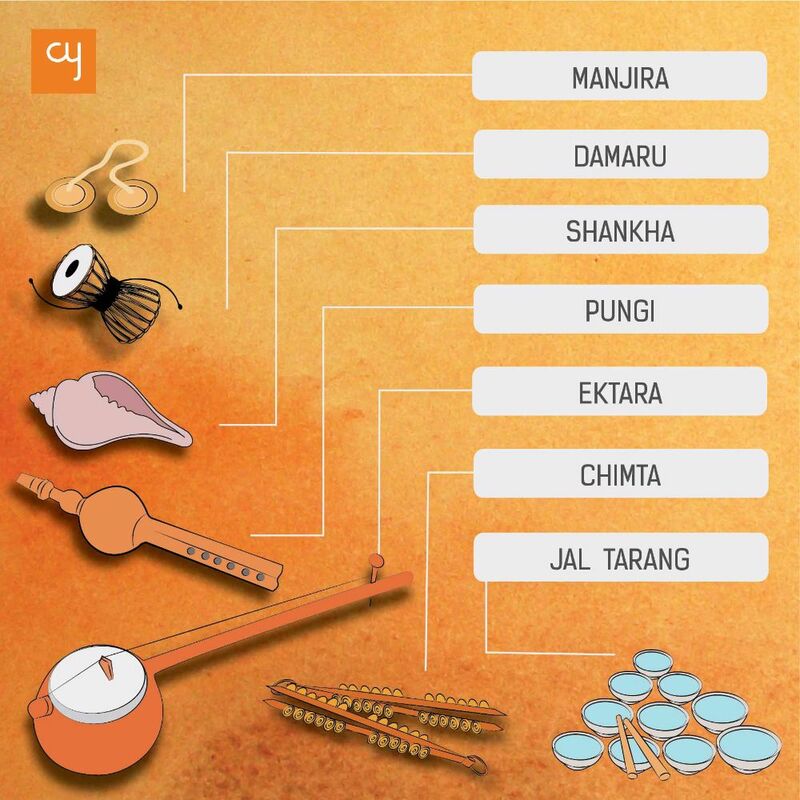 In Indian philosophy and Hindu mythology, Bindu (a point or dot) is the source of energy and life, it’s where the creation is born. Bindu is, “shunya”- the abstract of nothingness and yet that which has the ability to add value to whatever it is affixed to. 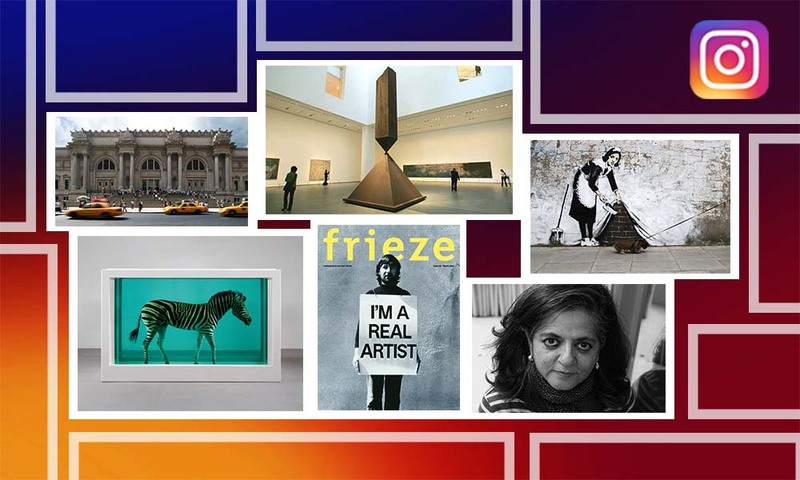 Come and learn the art of acrylic painting inspired from the series of, “Bindu” by India’s famous contemporary abstract artist – “S.H.Raza” in this workshop. Acrylic painting is a type of painting where you apply with the paint brush single or multiple layers of acrylic paint which is water soluble and dries fast. Acrylic painting can be done with either finesse or smoothly or with the brush strokes seen or impasto way. This workshop is organized by pH Designs in collaboration with Versatile Maniacs. – Introduction to Round, Flat and Filbert brushes. – Color mixing and merging on pallet and canvass. – Practice sheets to practice the techniques of painting with acrylic color. 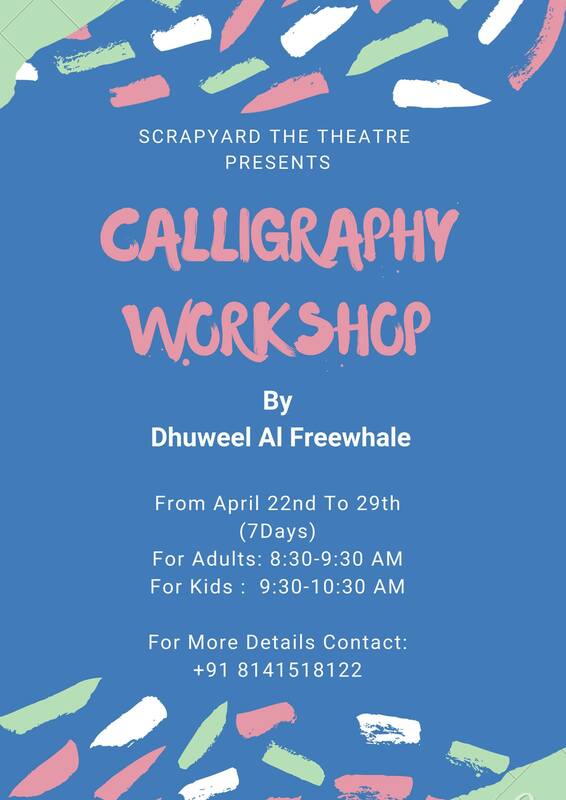 7 days Calligraphy daily Workshop from 22nd to 29th April, (for Children & Adults) Brush Calligraphy or lettering is a fun way to express your personality and add beauty to your day-to-day life. it is popular because of it’s fun. With practice, you’ll train your brain and muscles to effortlessly make fluid letters. Don’t worry about perfection. The best part of Brush Calligraphy is that it’s not perfect. Unlike formulaic type-fonts, brush calligraphy can be as original, whimsical, and creative as you are. Before you know it, you’ll be delighting people with one-of-kind invitations, cards and decor. Source : Facebook. Brush Calligraphy or lettering is a fun way to express your personality and add beauty to your day-to-day life. it is popular because of it’s fun. With practice, you’ll train your brain and muscles to effortlessly make fluid letters. Don’t worry about perfection. The best part of Brush Calligraphy is that it’s not perfect. Unlike formulaic type-fonts, brush calligraphy can be as original, whimsical, and creative as you are. Before you know it, you’ll be delighting people with one-of-kind invitations, cards and decor. Hello peeps! 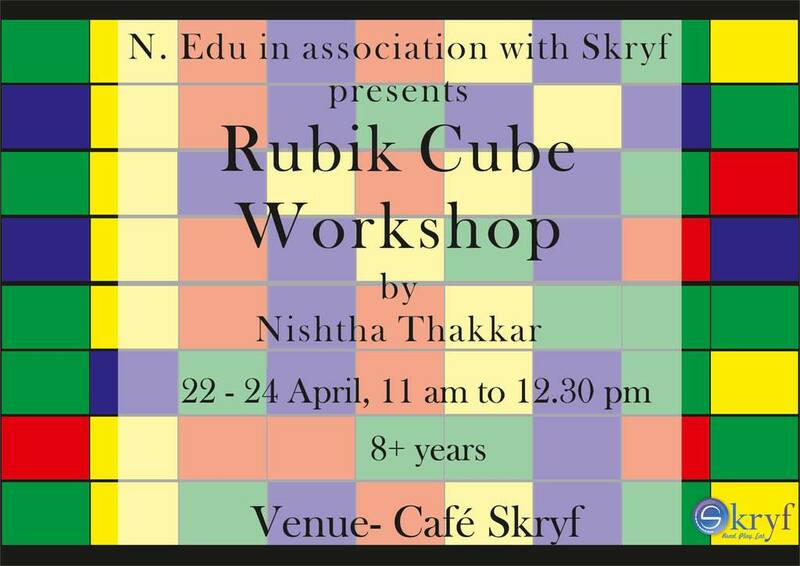 N edu presents Rubik Cube (3×3) workshop in association with Skryf. Learn how to solve the cube with the method of remembering. It’s a 3 days workshop! Date – 22, 23 and 24 April Time – 11 am to 12:30 pm Age group – 8+ Source : Facebook. N edu presents Rubik Cube (3×3) workshop in association with Skryf. Learn how to solve the cube with the method of remembering. It’s a 3 days workshop!